When you pick up a good tomato, it should feel heavy for its size and have a distinct tomato-y smell. It should have a little “give” when you feel it, but not be mushy, and the skin should not be bruised or have blemishes or cracks. The best place to get tomatoes is in your own backyard vegetable garden or from a local farmer’s market. Tomatoes in the grocery store are often picked before they’re ready, artificially ripened, and not as flavorful as the locally grown fresh varieties. Canned tomatoes can often be better than the tomatoes in the grocery store. Do not refrigerate tomatoes, because their texture will change; they’ll become mealy. Instead, store them on your counter top in a cool, dry spot, stem side down. Don’t stack them on top of each other, because they’ll tend to make each other mushy. Store them in a single layer. There are roughly three types of tomatoes generally found at the grocery store. One popular kind is the beefsteak tomato. It is grown for fresh use, and it yields large slices perfect for sandwiches! 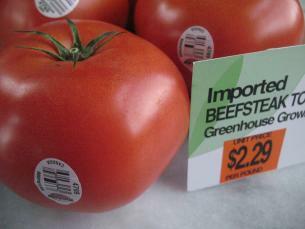 Look for the sign or the label on the tomato itself. Cherry tomatoes and grape tomatoes are the most popular. These are great for adding tomato flavor to dishes without any of the moisture associated with the cut fruit — perfect for pasta salads or green salads! In the summertime, especially at Farmer’s Markets, there are of course, many more varieties of tomatoes available. Here’s a great website with a description and photos of dozens of tomatoes. It can be a matter of preference but, generally speaking, for recipes with quick cooking times it is best to peel the tomatoes. Recipes that call for a long simmering time usually do not have you peel the tomatoes. In my Guacamole recipe I do not peel the tomato but I do seed it as all those extra seeds (and juice) really throw off the texture and can make it watery. Start by cutting an X in the bottom of the tomato with a very sharp knife. You want to just pierce the skin. If you are peeling just one or two (or three!) tomatoes put them in a heat-proof (Pyrex) bowl big enough so that when you add the water they will be totally covered. Remove the tomato from the water with a pair of tongs. You can also do this in a pot of boiling water, using tongs to add and remove the tomato from the pot. 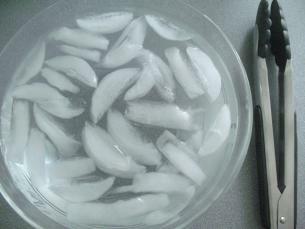 Prepare an ice-bath, which is just a bowl of water with ice cubes in it. 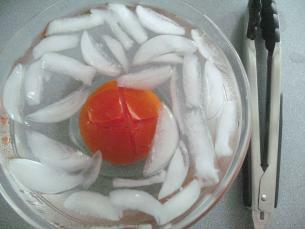 Using tongs, drop the tomato into the ice bath. …and the tomato is all peeled. To remove the seeds, cut the tomato in half with the blade of the knife parallel to the stem. You can gently squeeze the tomato to remove the seeds, or just ease them out with your finger. Once tomatoes are peeled and seeded they can get added to salads, dips, sauces, cold soups, etc. The longest part of the entire process of peeling and seeding a tomato is boiling the water! If your garden is bursting with fresh tomatoes you can actually freeze raw tomatoes. “Tomatoes may be frozen whole, sliced, chopped, or puréed. Additionally, you can freeze them raw or cooked, as juice or sauce, or prepared in the recipe of your choice. Thawed raw tomatoes may be used in any cooked-tomato recipe. 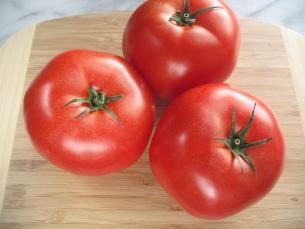 Do not try to substitute them for fresh tomatoes, however, since freezing causes their texture to become mushy. Tomatoes should be seasoned just before serving rather than before freezing; freezing may either strengthen or weaken seasonings such as garlic, onion, and herbs. Select firm, ripe tomatoes for freezing. Sort the tomatoes, discarding any that are spoiled. Wash them in clean water. Dry them by blotting with a clean cloth or paper towels. Prepare tomatoes as described above. Cut away the stem. Place the uncut tomatoes on cookie sheets and freeze. Tomatoes do not need to be blanched before freezing. Once frozen, transfer the tomatoes from the cookie sheets into freezer bags or other containers. Seal tightly. To use the frozen tomatoes, remove them from the freezer a few at a time or all at once. To peel, just run a frozen tomato under warm water in the kitchen sink. Its skin will slip off easily. If you prefer to freeze peeled tomatoes, you can wash the tomatoes and then dip them in boiling water for about 1 minute or until the skins split. Peel and then freeze as noted above. All canned tomatoes are not the same. One should not dismiss canned tomatoes if the first brand you try does not meet your standards. There are many to choose from. Please keep in mind that some brands may have superior canned whole tomatoes but their “roasted” canned tomatoes are rated inferior. This is one purchase where you really need to read the label carefully! Chris Kimbal, over at America’s Test Kitchens, provides a useful guide. One of the many wonderful things they do at America’s Test Kitchen is test ingredients. If you would like a more in depth description of America’s Test Kitchen Review, head on over to America’s Test Kitchen and sign in! Thanks ATK! Links to Some Great Tomato Recipes! Fresh basil is fragrant and delicious! My Marinara Sauce uses canned tomatoes with a nice big bunch of fresh basil. You can wash fresh basil the same way you wash lettuce. One of the easiest ways to use tomatoes is in Insalata Caprese, an Italian salad that combines tomatoes, fresh mozzarella cheese, fresh basil and olive oil. It’s that simple! A basic Tomato Sauce Recipe can be made and frozen for future use. Home made Tomato Soup is surprising easy to make and it is m-m-m-m good! When summer is bursting with fresh tomatoes and high temperatures, cold Gazpacho is a filling and refreshing soup. Pasta Salad is the perfect meal to enjoy all year round. Bow-tie pasta, salami, olives, green onions, feta or goat cheese, and of course tomatoes make this salad a summer favorite! This one’s got a long name, but it’s so mouth-wateringly delicious-sounding that I have to tell you the whole thing: Tomato and Fresh Basil Crostini (toast) with Feta and Roasted Garlic Cheese Spread…mmm. A great appetizer similar to bruschetta. Tomatoes stuffed with rice are an easy and elegant dish to serve your summer dinner party guests. Try adding vegetables, sausage pieces, or ground beef to your rice mixture. Fried green tomatoes are another classically southern dish. Green tomatoes have a tangier taste than red ones, and when breaded and fried, they make a crispy and fresh appetizer, addition to sandwiches, or side for crab cakes. Don’t forget about the classic BLT sandwich! Taboule (shown below) will keep you cool because there’s no cooking involved! Plus, with fresh flavors like tomato, lemon, and mint, you can’t go wrong. We’ve spent the last two weeks dining on heirloom tomatoes from the local farmers markets. Wow! They even taste like tomatoes. I had started to forget that tomatoes even have taste. What could be nicer than a fresh tomato sandwich on a sunny day? That’s what summer tastes like to me! Summer and fresh tomatoes seem to go hand-in-hand. When I was growing up my Dad had a huge vegetable garden. The “heirloom” tomatoes he grew, we just called “tomatoes”. We would eat them still warm from the garden. Last week at the Farmer’s Market I picked up two that brought back such wonderful childhood memories. Alas the price tag brought me back to reality; $8 for two tomatoes! When I was 8 years old, the mother of a friend of mine in San Diego handed me a tomato she’d grown in her backyard and told me to just bite into it like a fruit. I thought she was crazy, but I did it, and I was totally blown away. I’ve never forgotten that tomato, but it’s difficult to find ones in New York that taste that way, short of spending, as you say, $4 per tomato. These are great tips but I am surprised you do not suggest hulling the tomatoes before you blanch them. Once they’re peeled, it’s pretty tough to get the little stem/core part out (I don’t know what it’s called). Good point Michelle about when to hull the tomato. I find that if I do it before I blanch the tomato, the tomato get watery. BUT having said that, they are slippery little guys without the skin on them! You really have to be very careful or remove the stem first! Wow, you really covered tomatoes well. I like to go to the local market garden for fresh picked organic tomatoes. Then, I immediately can them myself to enjoy year round. It’s really easy, but messy! Just peel and fill jars, press them down to remove air space & release juice. Process to seal. They taste wonderful! Yes I did get carried away talking about tomatoes! A friend gave me a huge can to diced tomatoes after she had removed about 2-3 cups from it. Is there any way that I can freeze them? I would freeze them in a zip-lock bag. Put two cups in a quart size freezer bag at a time and zip it tightly. If you lay it flat and smooth it out, it should take up very little space in the freezer. Don’t forget to label and date the bag!